In spite of being among the top students in his school, Joseph Nelzy was quick to give up on being admitted to one of the nation’s best colleges after he got a rejection letter from Brandeis University. “I had no hope after that,”Nelzy, 18, said in the college advising office at Abraham Lincoln High School, a huge Depression-era building in Brooklyn’s Brighton Beach section, more than half of whose students live at or below the poverty line. But as Nelzy brooded over the rejection, hope arrived the next day in the form of an email. It was an acceptance to Cornell University’s Class of 2018, which was later followed by an offer of a full scholarship. “It was just the best feeling I ever felt,” recounted Nelzy, who has a 3.8 grade-point average and is 15th in his graduating class of 537 students, and who has had his sights set on college ever since he and his mother and stepfather fled political instability and violence in their native Haiti in 2008. 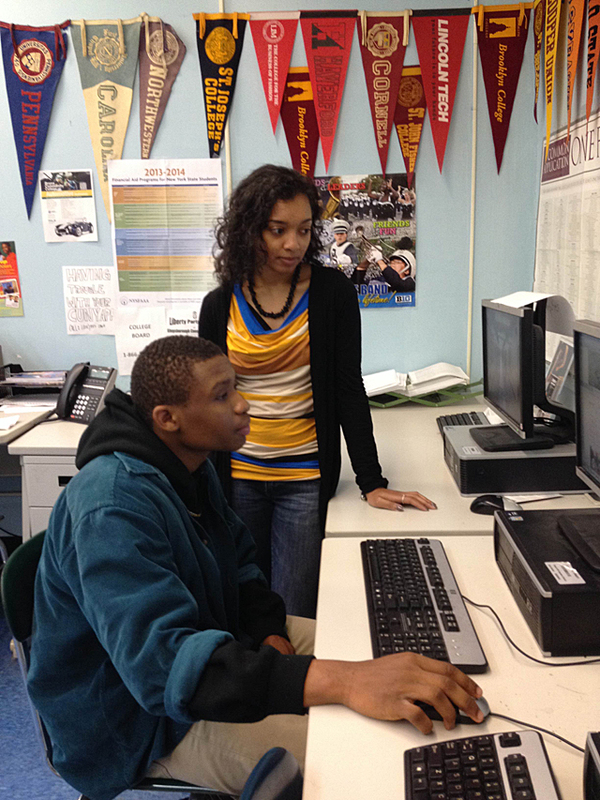 Joseph Nelzy and his College Match advisor, Alysha Rashid, at Abraham Lincoln High School in Brooklyn. Stories like Nelzy’s are unfolding for a few dozen seniors at Lincoln chosen to participate in an experimental program called College Match that tries to encourage and counsel low-income, high-achieving students to apply to selective colleges that match their academic qualifications. Research shows that most top students from low-income backgrounds don’t aim so high. In a phenomenon called undermatching, the “vast majority”of the 25,000 to 35,000 highest scorers on the SAT and ACT who come from low-income families don’t apply to selective universities and colleges for which they’re not only qualified, but can likely get generous financial aid, according to research from Harvard and Stanford. Instead they go to poorly chosen colleges and universities with low graduation rates, or forgo a higher education altogether, largely because of a lack of encouragement and information, the researchers found. One outcome: less diversity among America’s future leaders. “The “vast majority” of the 25,000 to 35,000 highest scorers on the SAT and ACT who come from low-income families don’t apply to top colleges for which they’re qualified. “If you think of elite colleges as kind of the path to a lot of those positions of leadership —if you think it’s important to have people from a diverse set of backgrounds in income, race, gender, being an immigrant —then this is an important problem,”said Matthew Chingos, a fellow in the Brookings Institution’s Brown Center on Education Policy. There’s a more pragmatic reason to push bright low-income students into college, too: The number of high-school graduates has been declining since 2010, according to the Western Interstate Commission for Higher Education, or WICHE, which tracks this. College enrollment is down, the National Student Clearinghouse reports. Fewer of the students graduating from high school now are affluent or white and increasing numbers are ethnic minorities and the children of immigrants. By 2020, WICHE estimates, minority students will make up 45 percent of the nation’s public high-school graduates, meaning colleges will have to recruit them to fill seats. So severe is the problem of undermatching considered among some policymakers, it got added attention at a White House summit on higher education and has become a cause of First Lady Michelle Obama. The College Match program at Lincoln seeks to address it by bringing in advisers to help seniors with a 3.0 GPA or higher to apply to their “best-fit” colleges based on their academic records, personal situations, and financial needs. College Match began in eight low-income schools in Chicago after research at the University of Chicago found that in the Chicago Public School system, only 59 percent of high-school seniors who said they aspired to go to college ever actually applied. Among the students who were qualified for admission to very selective colleges, only 38 percent enrolled in one. The project, administered by the nonprofit organization MDRC, previously called the Manpower Demonstration Research Corporation, assigns advisers to work with the highest-achieving students. Called near peers, the advisers at Lincoln are recent college graduates themselves, close to the high school seniors’ ages, and can give them more personal attention than they would otherwise get from school counselors with large caseloads. At Lincoln, the near peer is Alysha Rashid, a 2011 graduate of, and former admissions officer at, Adelphi University, who uses a “match list”of colleges throughout the Northeast to pair the students with institutions that match their academic profiles. Rashid said she has been pleasantly surprised by how often students turn to her for advice and help with college essays. “I don’t think a lot of them even realized they needed help,”she said. Of the 630 college applications sent by seniors at Lincoln, there were 204 acceptances. Among the 80 students in the College Match program, 35 got into their “match”college, and another 16 were accepted into another college or colleges. “I was hoping for higher,”Rashid said. At Lincoln, although there is no comparison group, College Match has started at least a few students, like Nelzy, into competitive schools. Nelzy will major in human ecology at Cornell. He hopes to eventually become a doctor. One of the things that struck him the most when he arrived from Haiti, he said in his college essay, was how many students in the United States seemed to lack a passion for learning. Jamaal Abdul-alim is a Washington, D.C.-based freelance writer who specializes in coverage of higher education.